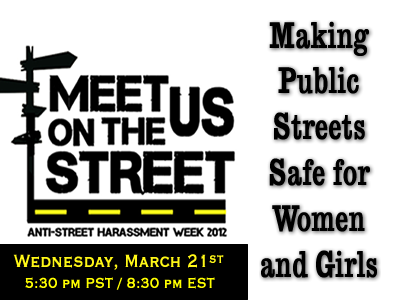 Leave Women and Girls Alone – Stop Street Harassment Week March 18-24, 2012 : Ask HeartBeat! March 18-24th is International Stop Street Harassment Week. Girls and women around the world will hold educational lectures in schools and community forums, marches, social media blasts, and distribute literature explaining what street harassment is and why it must stop. The Information Superhighway has provided men with the option of harassing women online in chat rooms and on social media with sexual innuendo, sexist comments, and outright solicitation. Offline, many males think that their catcalls, whistling, public masturbation, flashing, groping, stalking, and assault on the bodies and minds of females is “flattering”. In reality, gender-based street harassment makes public places unfriendly and even scary for many girls and women. This type of behavior is especially prevalent in the U.S. in urban areas heavily populated by Black and Latino men. Join us for a discussion on what constitutes street harassment and why so many American men think harassing women in public places and on the street is an appropriate way to behave. Call 347-327-9215 to participate in the interesting discussion!